While on a festive shopping trip last week, carrying far too many bags than was probably good for my back, I slipped through the doors of my local Lush store and headed straight to the display of bubblegum pink bottles I know make an appearance every year without fail. The shop assistant simply said to me “now there’s a woman who knows what she’s after…” For as long as I can remember, I’ve made an essential Snow Fairy purchase and the Christmas season isn’t really Christmas (in my bathroom at least) until there’s a bottle of this in my shower. The bold colour and verging on sickly sweet scent are ingrained in my mind as something as associated with December as boxes of Quality Street and mince pies. I make each bottle last as long as physically possible, only squirting out a little onto my hand when I can fully enjoy the experience, but at the end of the day it’s just a shower gel. So how has this sweet scented liquid gained such a special place in the hearts of so many? Although I usually hate anything super sweet and full of bubblegum scent, I make a total and utter exception for Snow Fairy. Maybe because at this time of year everything is super sparkly, super sweet and super OTT my senses aren’t as offended – in fact, it’s a fragrance that instantly brings joy to my face every morning. If bubblegum and candyfloss don’t make you feel happy then nothing will, and this is a really simple way to bring pleasure to a ritual we undertake every day. In a way, it’s basically happiness in a bottle… And that’s what we’re buying, not just pink shower gel. For me, the festive season is all about traditions and memories. It’s about putting up the tree listening to classic tunes, spotting the first Coke ad of the year and demolishing half your advent calendar at once because you forget to open it every morning; it’s about wearing new pyjamas on Christmas Day, having variety boxes for breakfast and watching Doctor Who in utter silence. I can’t remember the first time I bought a bottle of Snow Fairy, but for a long time it’s played such a part in the season for me that it’s comparable to those red cups and gingerbread lattes. It’s become a tradition to pick up a bottle or two of the pink stuff, and I’m all about traditions. When something is only available at certain times of the year it makes you want it more. (Hello Creme Eggs!) Lush have a very clever marketing department and by making this only available a few months of the year they cause a frenzy every time. When you see it you *have* to buy it, because it probably won’t be there when you next walk past – and good luck trying to get some in the January sales! The joy of Snow Fairy is limited between October-ish and December, giving you a real window of opportunity from which to enjoy it before it goes again. What can I say, we’re easily swayed. Over the years Lush have added more and more varieties to the Snow Fairy family (including a body conditioner, bath bomb, soap, bubble bar and naked shower bar) but it’s the shower gel that will always have a special place in my heart. Does it have a special place in yours too? 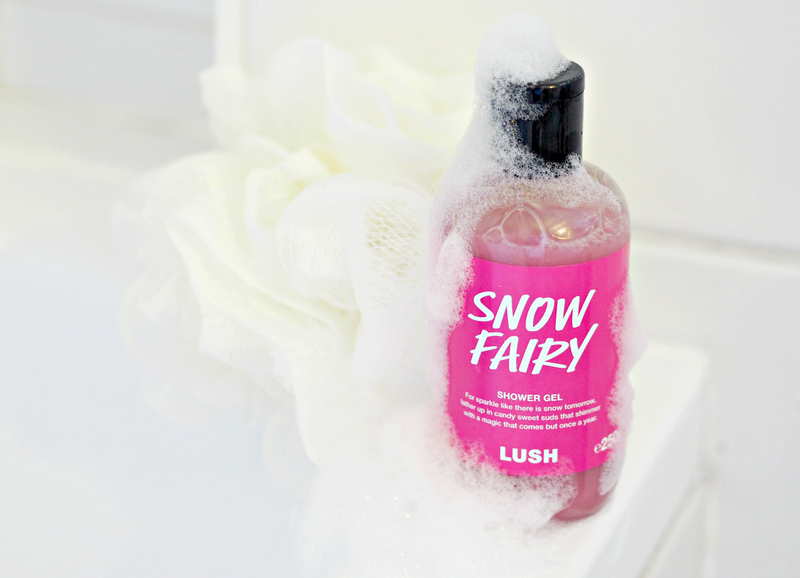 Discover the Lush ‘Snow Fairy’ collection here, priced from £4.95. It's such a special thing, but at the end of the day it's pink shower gel! It's amazing how it's become such a christmas tradition! Good luck with that 😉 It's like gold dust! I absolutely adore snow fairy! I have the shower gel and body conditioner now and I can’t go a Christmas without it!